After several weeks of quieter tunes, I think it would be a good idea to crank things up a bit again? What do you think? Well, what better way to do so than with some fresh technical death metal from Belgium? 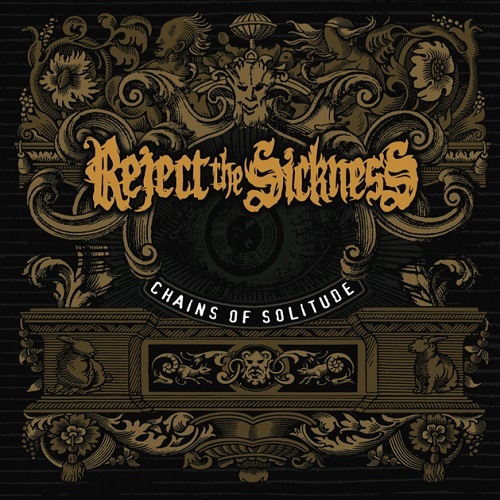 But don’t roll your eyes in case you expect yet another bog standard metal act: Reject The Sickness add a few tasty flavors to the genre on their new record Chains Of Solitude! Read on to find out more! The quintet has a fairly modern sound and also draws influences from modern metal acts, which can clearly be heard from the start. While the song structures are reminiscent of the classic bands everyone knows and loves, you will periodically find the occasional metalcore breakdown and chugging riffs along the way. Melody is also a big factor for the guys, since it is omnipresent, mainly in the guitar department, throughout the eleven tracks. The groove is also strong with these musicians, and provides quite a few memorable headbang passages during the forty minutes, but the majority of the songs are filled with barrages of blast beats and crazy double bass work. The vocals are mostly comprised of guttural growls, interspersed with maniacal screeches and topped off with fierce screams. Occasionally, however, the singer dives into a sort of clean vocals that gave me a very Gojira-esque vibe, which at times did feel a bit out of context, but didn’t throw me off too much. All in all, Reject The Sickness is one of those bands that I’d like to write more about but feel unable to be descriptive or convincing enough…so I simply end this with: listen to Chains Of Solitude. It’s a solid record and it might tickle you in just the right spot. Song below and info on Facebook as usual. Take care until next week!